Our cleaning agency was established in 2001 in London with a mission to always provide quality and professional cleaning services for all types of clients owning or renting different properties either domestic or commercial. As the years have gone by, we have expanded our business, gaining a huge number of clients and employing either full time or contractual professional cleaners. This is a result of our passion and motivation for consistent superior performance and results. 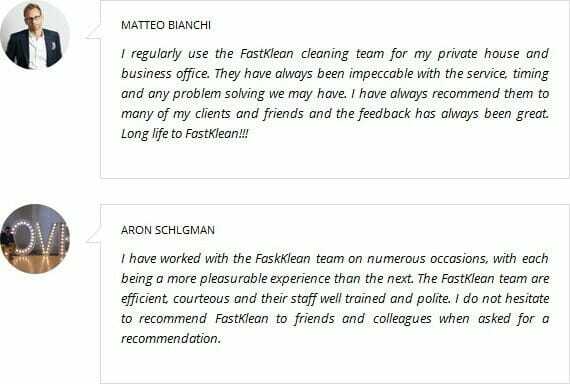 Thus, FastKlean is now recognised as one of the best cleaning company in London. We credit our reputation with our desire to maintain and only employ industry standard cleaning methods and application of eco-friendly chemicals and solutions. We also take pride that our staff are carefully hired and undergo rigid training. They are fully insured and have appropriate references and personal background investigation. You can access this information upon request. We offer different kinds of cleaning operations with only one purpose- Customer Satisfaction. We take our efforts seriously so our clients rely on us when it comes to their problems of dust, dirt, germs, stains and residues, carpets, mattress, windows, cabinets, kitchens, patios, gates, stairs, doors, walls, and even carpentry works and home appliance repairs. Our customers can always be assured of receiving the best service. Therefore, they do not have to look for other companies because they won’t be disappointed with our cleaning agency London. It is our responsibility to cater to all types of customers. As such, we always prepare a work plan based on their needs, tastes, and preferences to suit their own specific requirements. Our cleaning prices are negotiable and we even provide special offers and deals to reward their loyalty and ensure great savings from us. Do not hesitate to call us if you want additional details on 020 8884 9149.